Barbara Jordan would have been 83 today. 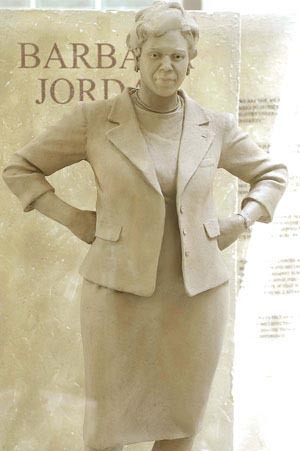 Design model for a statue of Barbara Jordan for the University of Texas. Sculpture by Bruce Wolfe; the installed statue is in bronze. I like this plaster model, too. A government is invigorated when each of us is willing to participate in shaping the future of this nation. In this election year we must define the common good and begin again to shape a common good and begin again to shape a common future. Let each person do his or her part. If one citizen is unwilling to participate, all of us are going to suffer. For the American idea, though it is shared by all of us, is realized in each one of us. I covered that convention as a stringer for a western television station. I recall the spirit in the hall when Jordan spoke, and the great spirit that enveloped the entire convention and the City of New York. After the convention every night the cops would stop taxis so delegates could ride. I remember watching two cops help a woman out of a wheel chair and into a cab, and the cabbie saying that the cops had never done that before — and he liked it. Jimmy Carter came out of that convention, and won the election, defeating Gerald Ford. Barack Obama won that election in 2008, and Hillary Clinton won the Democratic nomination in 2016. Jordan didn’t live to see that, either. In 2019, we face a Constitutional crisis again, with a crook in the White House hoping Americans forget about the Constitution. If ever we needed ghosts to come back to help us, we need the ghost of Barbara Jordan now. We could just run a film of her speech at the House Judiciary Committee markup of the articles of impeachment for Richard Nixon. Yes, this is an encore post, with some editing. Defeating ignorance takes patience and perseverance. Barbara Jordan would have been 72 today. Thanks to Pam for alerting me to the anniversary. 32 years ago. Barbara Jordan didn’t live to see her party come up with a woman and an African American man as the top two candidates for the nomination. That’s too bad. She could have given a great, appropriate speech. Maybe the Dems oughtta just run a film of Jordan from 1976. Rereading the Gettysburg Address and the Cooper Union speech of Lincoln, I wondered for a few moments whether there are others with similar gifts for words who might be on film or tape. It got me thinking about the vast gulf between religion on the one hand, and faith and justice on the other hand. Then I got a notice of a link from this post about Barbara Jordan, at Firedoglake. It’s a nice collection of links, a Barbara Jordan tribute all bundled up ready to unwrap. Sometimes truth does go marching on. The Cooper Union speech of Lincoln was 148 years ago, on February 27. Whose voice do you hear, really, when you read material that is supposed to be spoken by God? Morgan Freeman is a popular choice — he’s played God at least twice now, racing George Burns for the title of having played God most often in a movie. James Earl Jones? For substance as well as tone, I nominate Barbara Jordan’s as the voice you should hear. When Max Sherman called me to tell me that Barbara was dying and wanted me to speak at this service, I had been reading a story in that morning’s New York Times about the discovery of forty billion new galaxies deep in the inner sanctum of the universe. Forty billion new galaxies to go with the ten billion we already knew about. As I put the phone down, I thought: it will take an infinite cosmic vista to accommodate a soul this great. The universe has been getting ready for her. Now, at last, she has an amplifying system equal to that voice. As we gather in her memory, I can imagine the cadences of her eloquence echoing at the speed of light past orbiting planets and pulsars, past black holes and white dwarfs and hundreds of millions of sun-like stars, until the whole cosmic spectrum stretching out to the far fringes of space towards the very origins of time resonates to her presence. Now, when the nation seriously ponders impeachment of a president, for the third time in just over a generation, Ms. Jordan’s words have more salience, urgency, and wisdom. It’s a good time to revisit Barbara Jordan’s wisdom, in the series of posts at Virgotext. The rest of the hearing remarks are all here. It’s a longer clip than the others but honestly, there is not a good place to cut it. This is Barbara Jordan on the killing floor. This was a woman who understands history, who illustrates time and again that we are, with every action, with every syllable, cutting the past away from the present. She never mentions Nixon by name. There is the Constitution. There is the office of the Presidency. But Richard Nixon the president has already ceased to exist. By the time she finishes speaking, he is history. Virgotext’s collection of Barbara Jordan stories and quotes is an excellent source for students on Watergate, impeachment, great oratory, and Barbara Jordan herself. Bookmark that site. 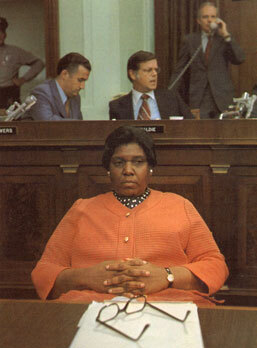 Rep. Barbara Jordan sitting calmly among tension, at a House Committee meeting (probably House Judiciary Committee in 1974).